Today, we are living in a high-tech era, wherein, the dependencies on machines have increased considerably. From construction to manufacturing, a wide range of technologically advanced machines are now being used in each and every sector to carry out distinctive projects. Moreover, due to the widespread modernization and evolving lifestyles, the need for designer homes, offices, stylish furniture, and decor has increased manifolds. So, in order to meet such ever growing and challenging demands, the role of modern tools in woodworking has become indispensable. Of all the modern tools available in the wood shops, table saws are the most frequently used tools, thereby offering a great deal of versatility to its prospective users. A table saw is usually composed of sharp and circular blades along with a powerful electric motor and is used for cutting hardwoods and other tough materials. There is a wide variety of table saws available in the markets such as Benchtop table saws, Cabinet table saws, Hybrid table saws, and Mini and Micro table saws. So, depending upon your needs and requirements, you can choose the one which proves beneficial for you and meets all your expectations. Here, we will be discussing some striking features as well as the potential benefits of Dewalt DW 745 Table Saw. Why Dewalt DW 745 is best? Dewalt DW 745 Table Saw is a powerful electrical equipment which helps you in getting quick and accurate cuts with lots of ease and convenience. Well-known for its powerful rip-cutting performance, it helps you to perform tough jobs such as cutting hardwoods within a fraction of minutes. It is composed of the sharp saw and carbide blades, a miter gauge, a powerful electric motor, a push stick and rack and pinion fence rails. Its convenient guarding system allows you to perform adjustments without using any tools, in a hassle-free manner. It is well-suited for woodworking and construction professionals for whom it proves to be a great investment option for sure! This table saw not only helps in getting the job done but also guarantees high-quality to its users. The basic reason behind the success of Dewalt DW 745 Table Saw is its powerful motor, retractable blades, compact and portable design, durable base, and seamless fence adjustments. Overall, its features are extremely useful and help you to carry out the woodworking activity effectively and efficiently. High-quality Sharp blades- Its 10” high-quality sharp edged blades allow you to finely rip the hardwoods without causing any friction. 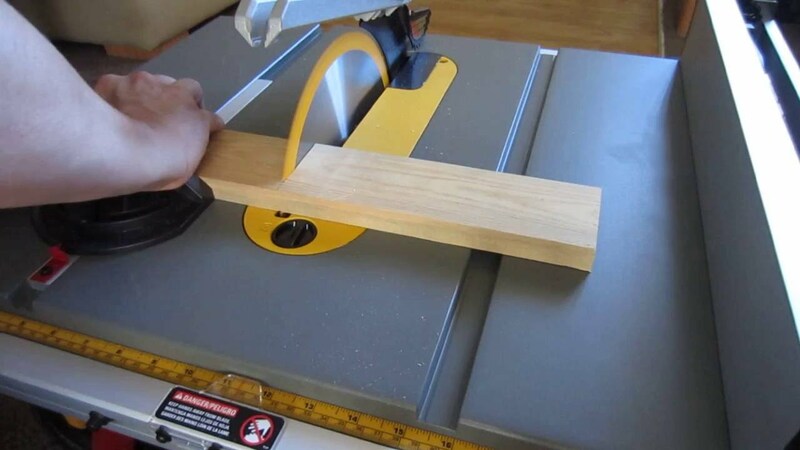 The quality, finish, and size of the blades of a table saw are the 3 most important factors which makes the entire woodworking experience engaging and purposeful. Its Carbide-material blade helps in achieving enhanced precision cutting and prolongs the life of the blades as well. Powerful performance– The Dewalt DW 745 Table Saw is composed of a powerful 15 amp electric motor which helps the saw to quickly rip through the hardwoods and pressure-treated lumber without consuming much of your precious time. Its high-energy motor produces up to 3850 RPM which makes the cutting process faster and smoother. Effective Guarding System– This table saw supports an extremely useful Guarding System which helps you to easily set up a wide array of applications and perform tool-free adjustments. Configured with a large 20-inch capacity for ripping, its pinion and rack mechanism allows you to make adjustments for the fence, smoothly and accurately. Along with a great ripping capacity, the Dewalt DW 745 Table Saw offers a maximum 3-1/8 and 2-1/4” inches of cut depth at 90 degrees and 45 degrees angle respectively, the maximum cut depth, however, is 2-1/4 inches. Portable- Its design is compact and light-weight in nature which makes it easier for you to carry and transport it from one location to another with ease or vice-versa. The Dewalt DW 745 Table Saw weighs around 22 kgs and its on-board storage makes it easier for you to access the push stick and guarding components while not being in use. It is also equipped with an easy dust collection port through which one can extract the dust efficiently and keep the workspace neat and clean. Highly Durable- Its dimensions are 25.8 x 26.5 x 13.9 inches and the overall built of Dewalt DW 745 is durable and sturdy in nature. 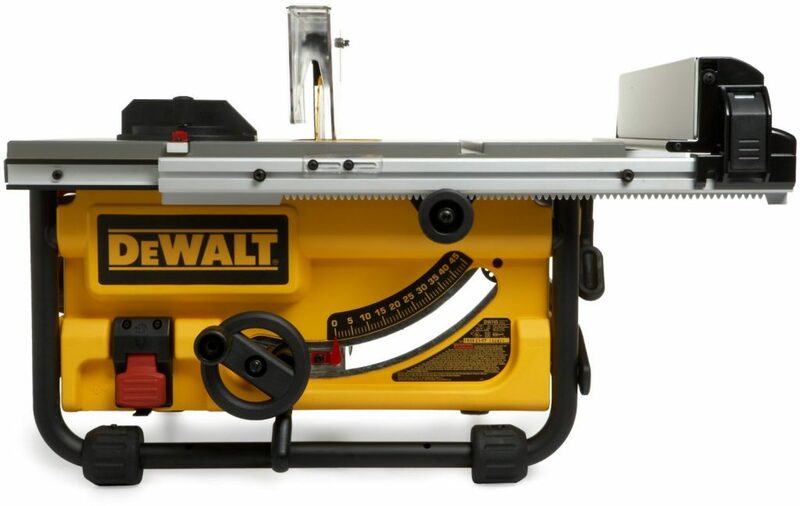 The table surface of the Dewalt table saw is also coated, so that you experience minimum friction while cutting through hardwoods and trimming materials. Moreover, it is also equipped with a metallic base which provides a strong and durable setup as compared to the plastic bases. It is a great equipment to use and offers numerous benefits to its users, but one thing that is to be kept in mind while buying this product is to check all the warranty details in order to ensure that the warranty is valid for international buyers as well. Dewalt is well-known for its durable and high-quality products and has been manufacturing such tools for over 80 years. Its lightweight and portable design help you to move it from one location to another without giving a second thought. 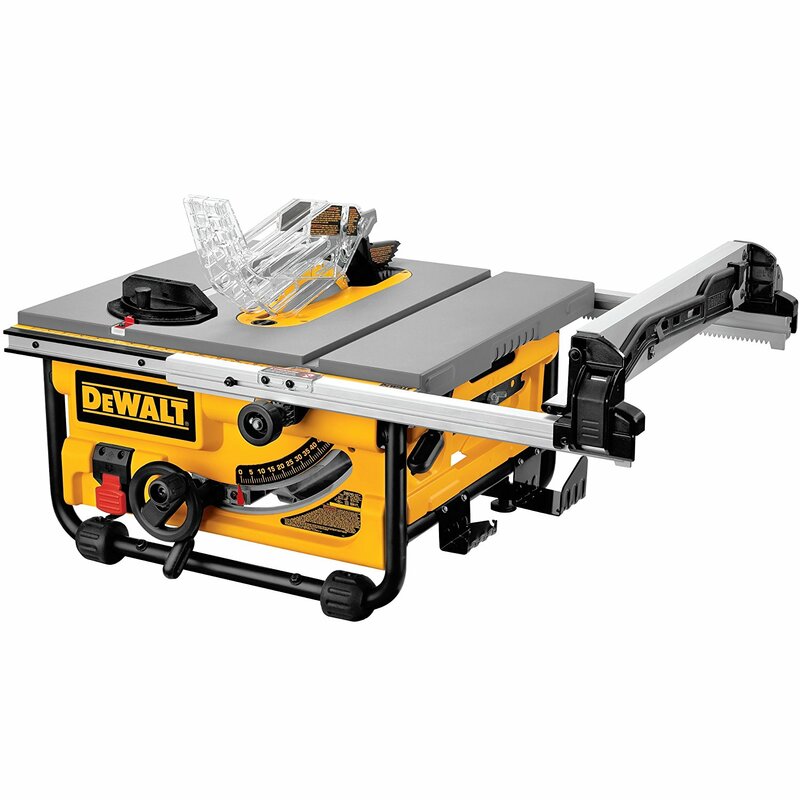 Moreover, its 20-inch rip capacity, high torque and no-load spinning speed of 3850 revolutions per minute make it an impressive performer among the rest of the table saws available in the markets. So, with such amazing and remarkable features, Dewalt DW 745 proves to be a class apart from its competitors and is considered as one of the most powerful Table Saws currently present in the market.